Toronto, January 8, 2018 – Probe Metals Inc. (TSX-V: PRB) (OTCQB: PROBF) (“Probe” or the “Company”) is pleased to provide new results from the 2017 drill program at its 100% owned Val-d’Or East project (the “Project”) located near Val-d’Or, Quebec. In 2017, the Company drilled 83,076 metres in 194 holes at Val-d’Or East. The drill program was focusing on expansion and exploration drilling in and around the New Beliveau gold deposit and on other gold zones along a 2.5 kilometre strike length within the Pascalis Gold Trend. An updated resource estimate, incorporating new drill results from the 2016 and 2017 program, is planned for Q1-2018. Owing to the success of the 2017 exploration program, the Company has commenced an 85,000-metre drill program that will continue the resource expansion along the Pascalis Gold Trend as well as testing high-priority gold targets in new areas within its 327-square kilometre land package during 2018. 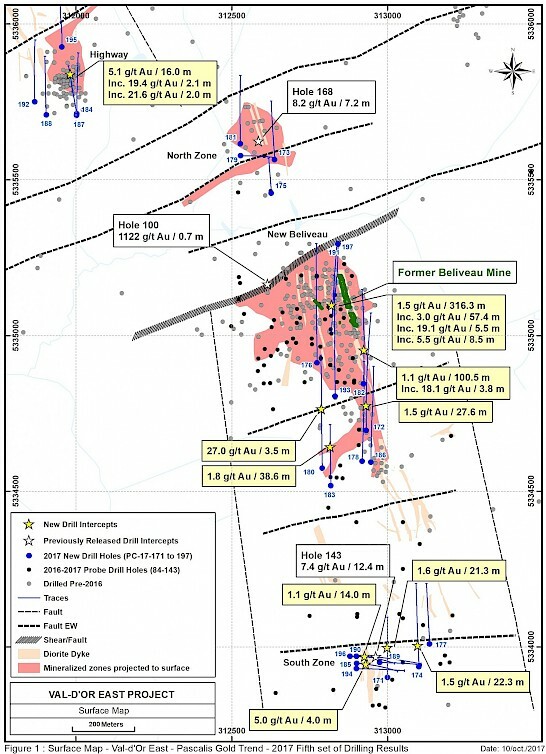 Results from thirty-eight (38) holes (PC-17-198 to PC-17-235) totaling 16,104 metres drilled along the Pascalis Gold Trend continue to demonstrate strong potential for expansion and new discoveries surrounding the former Beliveau mine (see Figure 1). Expansion drilling in the Main dyke 300 metres to the south has returned significant results with intercepts grading 3 g/t Au over 83.1 metres starting at 7 metres depth, including 5.3 g/t Au over 13.6 metres, 5.9 g/t Au over 5.5 metres and 10.8 g/t Au over 11.4 metres in Hole PC-17-207. Expansion drilling to the north of the New Beliveau deposit intersected 6.1 g/t Au over 6 metres at a vertical depth of approximately 300 metres in hole PC-17-224 along the eastern extension of the high-grade structure (1122 g/t Au over 0.7 metres, DDH PC-17-100), while expansion drilling to the Southwest of the New Beliveau deposit intersected 4.6 g/t Au over 6.5 metres at vertical depth of approximately 70 metres. Drilling to test the extension of the North Zone, approximately 60 metres west of high-grade hole PC-17-168, intersected significant mineralization grading 3.2 g/t Au over 12.4 metres between 10.8 metres and 23.2 metres depth, while continued testing of the eastern extension of the South Zone, 150 to 200 metres east of the discovery hole PC-17-143, intersected new mineralization grading up to 8.1 g/t Au over 3.5 metres between 77 metres and 80.5 metres depth. Drill results from thirty-one (31) holes (PC-17-236 to PC-17-267) that will be included in the updated resource estimate are still pending at the lab and will be released as soon as they are received. Mineralization intersected in all the gold zones are similar to that observed in the Beliveau Deposit, and are characterized mainly by sulphide-bearing quartz-tourmaline veins typically associated with mineralized diorite dykes. Following a successful 2017 exploration program on its Val-d’Or East project, the Company is planning 85,000 metres of drilling for 2018. The proposed $12 million exploration program will focus on expanding the Project’s current gold resources as well as delineate potential new gold deposits within its regional land holdings. There are presently five drills operating at the Project. Approximately 50,000 metres of drilling will be focused on the potential expansion of the New Beliveau Gold Deposit to the north, west, east and south of its current limits as well as other gold zones on the property. Approximately 35,000 metres of drilling will be focused on testing numerous high priority gold targets generated during the 2017 regional exploration program. The New Beliveau deposit consists predominantly of a series of parallel, east-west trending, moderately dipping, mineralized zones hosting gold-bearing quartz-pyrite-tourmaline veins. Gold mineralization occurs in the veins but also in their immediate wall rocks. The sulphide content is generally 1% to 5%, but may reach up to 10% in the higher-grade sections. The extent of the alteration zone, which consists of a mixture of quartz, tourmaline, dolomite, albite, and euhedral pyrite is commonly twice the thickness of the vein itself. The north-south trending diorite dykes also contain significant gold with gold grades typically increasing in areas where the dykes are intersected by the east-west quartz-tourmaline veins. Wall rocks for both systems consist of intermediate volcanics rock. Probe Metals Inc. is a leading Canadian gold exploration company focused on the acquisition, exploration and development of highly prospective gold properties. The Company is committed to discovering and developing high-quality gold projects, including its key asset the Val-d’Or East Gold Project, Quebec. The Company is well-funded and controls a strategic land package of approx. 1,000-square-kilometres of exploration ground within some of the most prolific gold belts. The Company was formed as a result of the sale of Probe Mines Limited to Goldcorp in March 2015. Goldcorp currently owns approx. 13.7 % stake in the Company.